A comparative study of the oxidation of ferrous iron ions by various cultures of acidophilic chemolithotrophic microorganisms in solutions obtained after ferric leaching of copper-zinc concentrate at 80°C has been carried out. It was shown that the use of a moderately thermophilic culture for bioregeneration of leaching solutions was preferable. At the same time, the oxidation rate of Fe2+ ions reached 0.88 g/(L h), or 21.1 g/(L day). 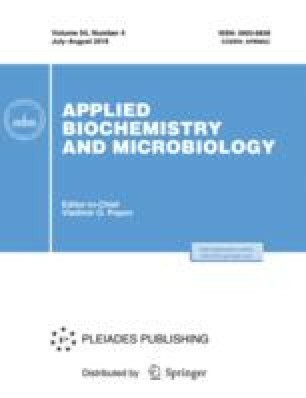 We propose that the activity of the moderately thermophilic culture was due to the presence of the mixotrophic bacteria Sulfobacillus spp., which used organic products of the microbial lysis for their growth. These products were formed during high-temperature ferric leaching of the copper-zinc concentrate with the biosolution. Original Russian Text © N.V. Fomchenko, M.I. Muravyov, V.S. Melamud, 2018, published in Prikladnaya Biokhimiya i Mikrobiologiya, 2018, Vol. 54, No. 4.